Here’s a story about what I spent doing the night after my first exam for semester 2, 2009. Borderlands was was preloading on Steam with the Left 4 Dead 2 demo , Stargate Universe S01E05 was downloading in glorious 720p, and my intertubes were a little clogged. With nothing else to do (study was postponed until Monday), some NCIS (the original) was in order. Unfortunately, this didn’t satisfy my geek curiousitys as much as I wanted it to – while it was certainly enjoyable, I needed something else. 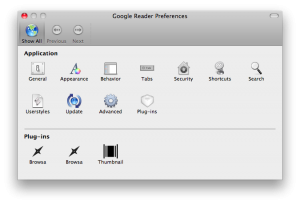 Problem number one: on my Mac, I use a Fluid-based SSB (Single Site Browser) tied into Google Reader for my RSS feeds. The exact reasons why are probably best left to another blog post, but it works, and I’m happy. The fact that it’s Reader inside an SSB isn’t the issue, however. 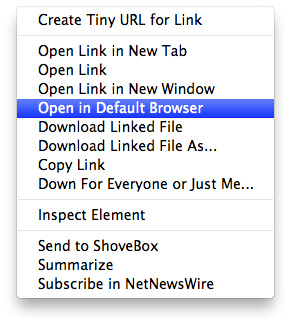 There’s an option inside my Reader SSB where I can send default links to my default web browser, in this case Firefox. Now this particular option can only be accessed from the right-click contextual menu as shown below. Of course, I could also click on the links themselves using the normal way – depending on what way I had my preferences set up, different things would happen. Clicking on a link normally would either a) open in a new tab in the SSB itself, b) open a new tab in my default browser while switching focus to the browser, c) open a new tab in my default browser in the background (i.e. keeping focus on the Reader SSB itself). What my current Reader SSB did was A. That was quickly fixed – a little radio button that said to only allow the SSB to navigate to certain websites soon had that fixed. Now, I had reached B – where the SSB would send normally-clicked links to the default browser while switching focus to the default browser. I didn’t like this as I like to share things with other people AND read them, and implementation B only allowed me to do so with an additional click. So, to test this I created a new Reader SSB, keeping my current one intact. Long story short – the solution lay in the preferences, or rather, the combination of certain preferences. The Problem: links sent to default browser via right-click contextual menu aren’t done so in the background. Make sure your SSB preference window looks like this. It is imperative that you have those two “Browsa” plugins below. Under Behaviour, make sure that the “Links sent to the default browser – open in the background” checkbox is ticked. This will make sure that any links clicked are sent to the browser are sent – in the background. Now, in the two Browsa plug-ins, under “Clicked links open in”, you need to have “System default browser”. I’m not sure why, but ticking that radio button makes links work properly. I’m still not quite sure what the initial issue was – my initial Reader SSB had exactly the same preferences, just with an absence of the Browsa plug-in preference panes. Note that now, normally-clicked links will be sent to your default browser, in the background. Also note how this is different to the original issue – it seems as though there’s a bug with the “send to default browser via contextual menu” option in FluidInstance, because no matter what I try, it just doesn’t work – regardless of whether the “open in background” checkbox is ticked or not. Hopefully this makes some sort of sense. Feel free to let me know if it doesn’t, and I’ll do my best to clarify. This post part of Blogtober 2009, and I do believe that it’s the first wordy post I’ve ever done for Blogtober. Feels good, but takes up more time that I like.